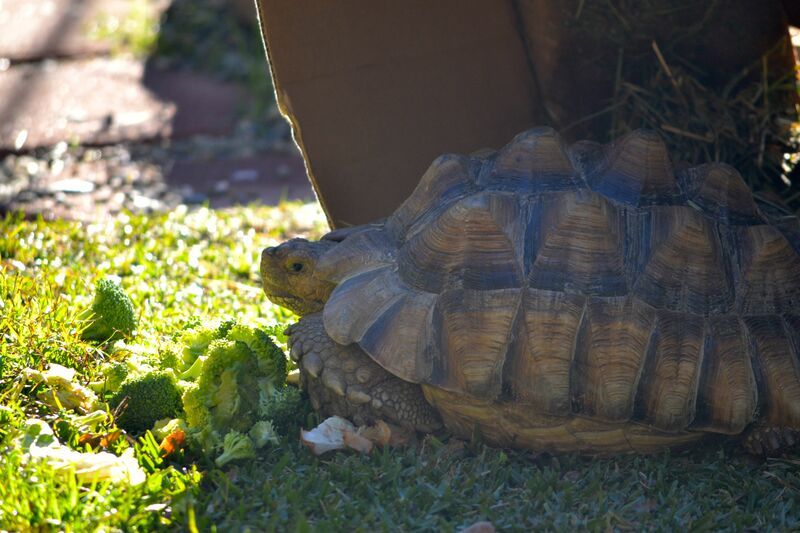 Weekend in review: Meeting a blogging friend and taking care of Darwin, a very cold tortoise. I know I go on a bit about the weather. But this weekend the temperatures were freezing. Literally. Los Angeles had a record low and although I don’t know how records are established when we have so many individual microclimates, I do know cold when I feel it. So before we took off for a Sunday in Santa Barbara, once again we rolled out the frost cloth. I also had some concerns for Darwin. It may seem a little odd, but I worry about that guy! 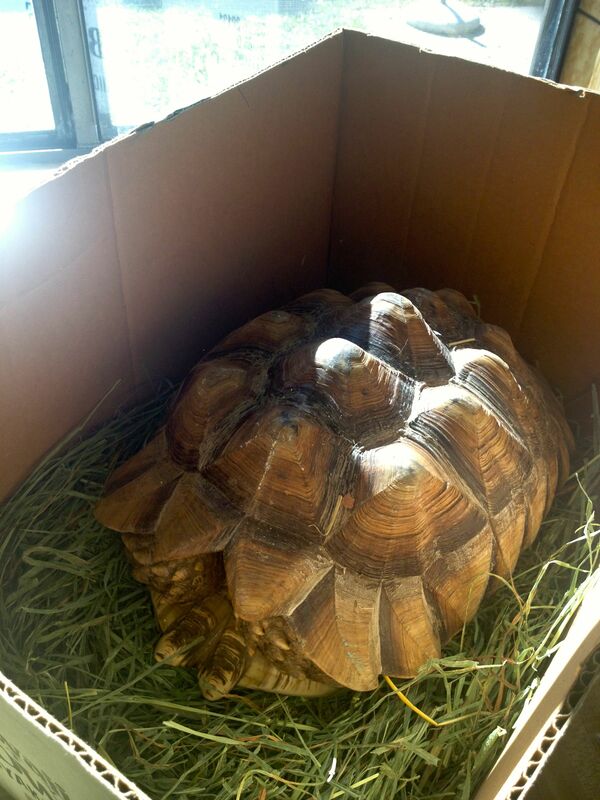 When it’s this cold, an African Sulcata Tortoise doesn’t come out to play. 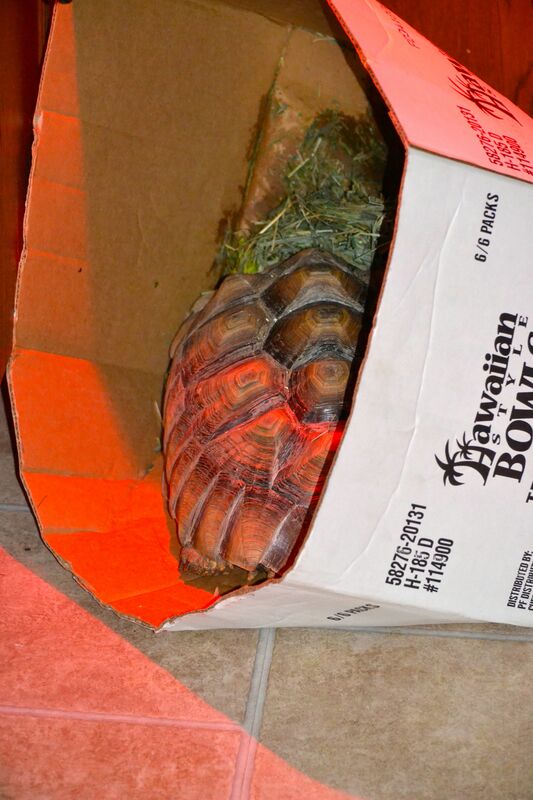 Sulcata’s don’t hibernate, so when he gets very still, how do I know if he’s in distress? 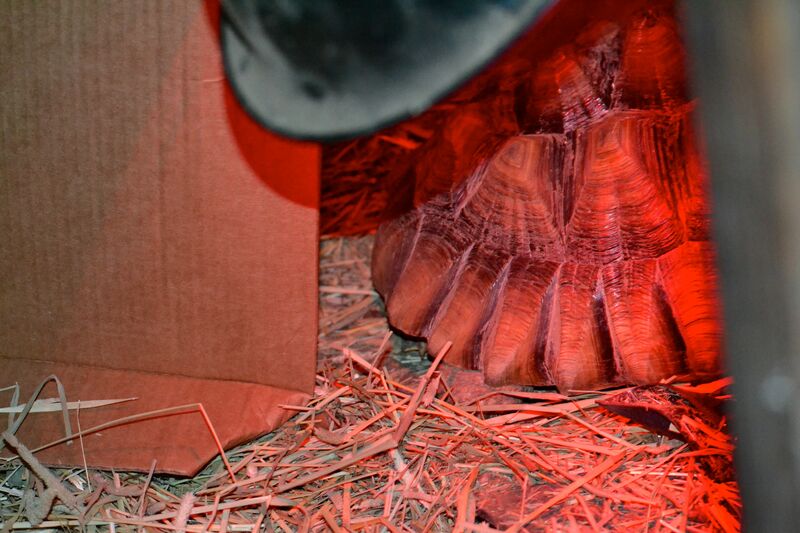 He isn’t eating, he doesn’t move about, and his shell feels cold, despite a belly pad and overhead heat lamp. So I persuaded my bemused husband that it was best if we brought him into the house! I promised it was temporary. I still wanted to give him a confined space to allow the spotlight to provide maximum exposure and to hold in the heat. For the first 24 hours he still didn’t do much. I poked at him just a little bit. I gently knocked on his shell. But into the second day, this is what we found. Seems he is fine after all. He must have warmed up. 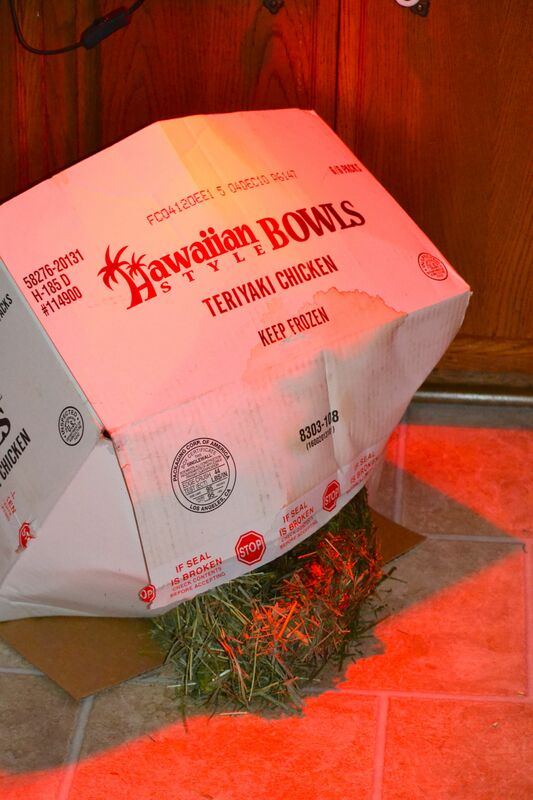 If he was active enough to move about the box, it was time to go back outdoors and catch a quick meal. Back to the comforts of his heat lamp. I will try to resist the need to go out and poke him just to see if he moves. A tortoise is very good at hiding his feelings! We had plenty on our agenda, but meeting a friend for breakfast was the first order of the day. 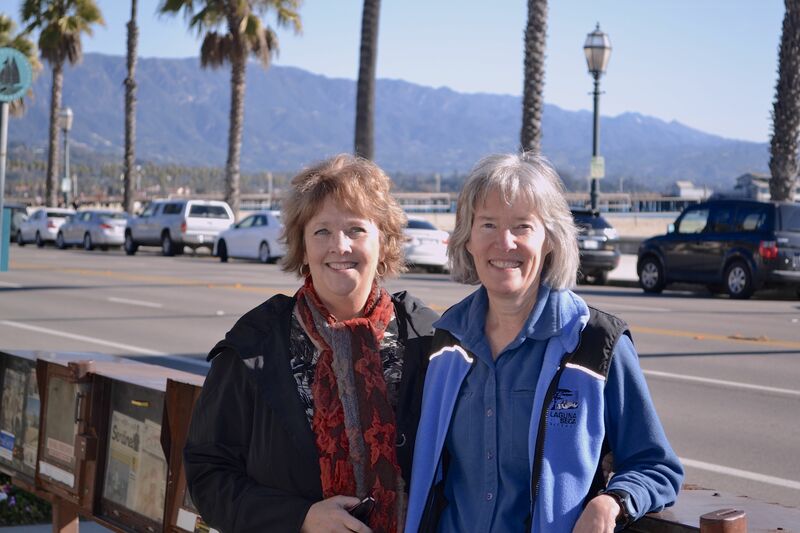 What fun for me to find myself in Santa Barbara with my blogging friend, Lori! Lori is host to Slow Happy Runner. I have enjoyed reading Lori’s blog for more than a year and was delighted to learn that she was going to briefly leave her Pacific Northwest home for a quick visit to Santa Barbara. How about that? 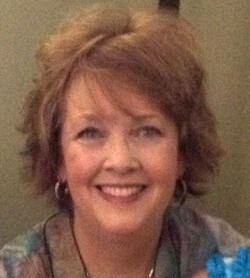 Click the link I’ve provided and you’ll go directly to Lori’s “about” page. I couldn’t begin to introduce her to you nearly as well as she does in telling about her interests and life experiences. She is a tremendously well-rounded and balanced person with such a positive outlook on living and experiencing the fullness of everyday experiences. 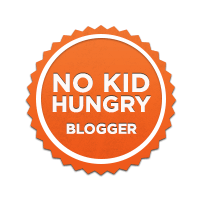 Lori has a second blog as well, Slow Happy Living. Slow Happy Living stems from the first blog with some new additions resulting from more recent and very nice changes in Lori’s life. I hope you’ll pop over and get to know Lori, and I am sure you’ll find a reason to stay and get to know her better. There is something very special about a personal encounter with a long-distance friend. Jay and I were so pleased to have met Lori for breakfast. And after a couple of hours of good conversation, sharing about ourselves and looking forward to keeping in touch, it was time to go our separate ways. There were so many things still on our agenda. Santa Barbara is a beautiful city, but I will need to tell you more about that later. I have dozens of photographs yet to organize. Now it’s time to take on the rest of the week with the same enthusiasm I hold for weekend activity. A little cold, but enthusiastic. That’s me! Holy Batman! Visiting the Batmobiles and it didn’t cost a thing! Debra, it was a pleasure to meet you as well. You were quicker than me at writing the post about it, but I’ll have mine up soon! That Darwin is such an inscrutable little fella. Your instincts, though, are sound, Debra. Glad he found his way to your home, where he’ll always be treated well. Sounds like your meeting Lori went very well. What fun and good for you all! I did enjoy meeting with Lori, John. I enjoy meeting new people…and this was easy since I felt like I already knew her from her blogs. 🙂 I do fuss over Darwin. I think because I’m cold I decide that he must be, too! He’s patiently waiting for Spring, I think! I can confirm that it’s cold in L.A.. When I walked the dog this morning at 10:30 there was ice on the sidewalks. I have never seen ice on the sidewalks before even when I walk at 7 am. I love the synchronicity that you and Lori were in SB the same weekend so you could meet up. I’ll be over to check out her blog. As I scrolled down to look at the photo of Darwin in your house I thought you were going to show us that he’d done something naughty… You are so thoughtful to think of bringing him into the house. He’s getting so big. Now this has peaked my interest… as a tortoise is a reptile do they not become dormant when temperatures drop??? We have so many in this country that are found in semi desert areas that experience sub zero temps in winter yet they survive… is it not, like snakes they become semi dormant slow down there metabolism and wait out the cold.??? I find this very interesting and will have to do a bit of research… but that is one lucky fellow that he found you to artificially warm up his world… good on you…. I do hope in time you will have the opportunity to meet with a blogging friend. I have really enjoyed the two opportunities I’ve shared. It’s really comfortable to be with a person you’ve never met, who isn’t really a stranger! And thanks for caring about Darwin. Our little critters, furry or otherwise, are so dependent on our care. And I sometimes surprise myself with how much I concern myself with his comforts. If he were in his natural habitat he wouldn’t have any of the perks we provide him! LOL! You do find some wonderful cruises, Frank. I would love to do an Alaskan cruise. Someday! It’s awesome … I recommended Vancouver to Seward … then do a few days on your own. Sounds like a great day and I’m glad Darwin is OK. I know a tortoise too, named Gulliver, but he’s a California Desert Tortoise, so he hibernates. He belongs to my friend Rachael, one of her many critters. Glad you had a chance to hook up with Lori. Blog Meets are such FUN. A little shell warmer then! That’s a good idea! 🙂 Lori is a very interesting woman with a lot of energy and a great attitude. You’d like her, Nancy! How fun that you met up with a blogging friend! You are in the arctic while I am wearing straw hats and summer clothes. Maybe the coasts have flip-flopped weather? Awe Darwin! I’m glad he is warming up! From what I’ve seen on the news, it has been almost as cold there as it is here, Debra. We are having such an odd winter, this being our first real cold spell and something like 325 days of less that an inch of snow. That is newsworthy here. How lovely that you and Lori could meet up. Isn’t it fun when this happens? As to Darwin, poor fellow. Such a cold snap for him to endure. Lucky for him he has you to care and fuss over him. You are a good soul, Debra, of that I am certain. Keep warm. I think we are finally warming up a bit, Penny. I’m sure that my biggest downfall is not taking the time to purchase a few warmer items of clothing. Sunday while we walked around Santa Barbara I noticed how many other “smart” women were wearing boots! I don’t own any, but I’m sure I need to change that. I need to have an emergency winter wardrobe! What fun to meet up with a blogging friend! I always thing that would be so fun, but then worry that it would also be awkward. It seems odd to “know” so many people through our blogs, but I do feel as though I do know many. It would be interesting to see how an in-person meet-up would go. It sounds like yours was fabulous. And I just love Darwin. That big guy has such a personality. Glad he’s staying warm. I’ll be meeting a blog friend this weekend, and really looking forward. It isn’t my first but still, I’m quite shy. Hehe 🙂 Glad it turned out well for you. That turtle, so adorable. Quite something else for a pet. I am behind in the blogs due to my daughter’s wedding and need to “settle down” but indeed, it has been FREEZING here. It was 30F the other morning. And I am glad Darwin weathered the freeze well. Their metabolism adapts, I’m sure, as temps in a desert will fall to much lower temps? And Santa Barbara! Nice! Where did you eat if I may ask? Congratulations on your daughter’s wedding, Koji! That is a big event in the lives of the whole family. I think we are starting to warm up just a little bit, and I’m glad for that. So is Darwin! 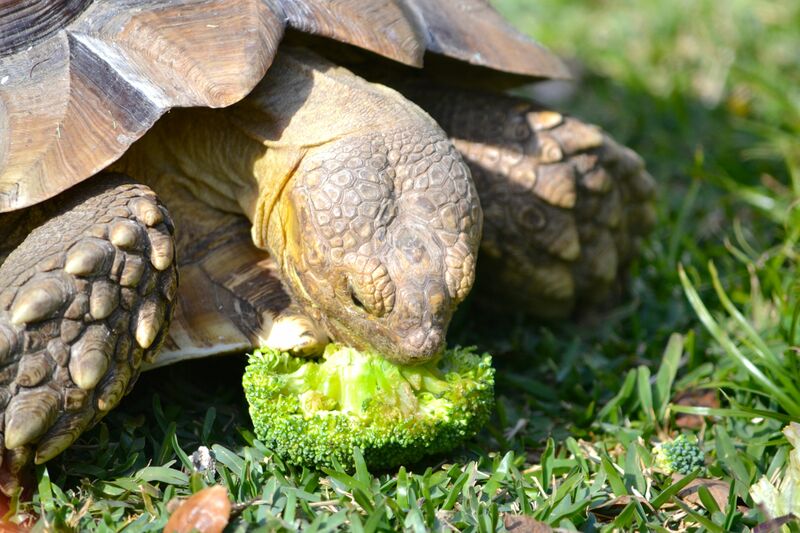 🙂 It’s true that the tortoise acclimates, but we have been told that an African Spurred Tortoise doesn’t do well and can get pneumonia in cold weather. What hasn’t been clear to me is at what temperature are we to be concerned. So I just baby him! And we met Lori at Sambos right on the Pacific. It was close to her hotel and we used to go there when our kids were small. They were accommodating to us as we possessed the booth for much longer than we would normally require–very hospitable. Sambo’s?! I haven’t heard of that name in over a decade or so due to “PC”. Is it one and the same? Still open for business? What a lovely meeting! Lori looks wonderful. And Darwin looks quite chipper too 🙂 Glad he was fine, Debra. It seems to be cold all over the northern hemisphere, Debra, so i’m glad you were able to give Darwin a change of surroundings that suited him. It is SUCH fun to meet fellow bloggers in person and I can so easily imagine how much you and Lori enjoyed the experience. now to go and explore her blogs…. We have warmed up a bit, Perpetua, and Darwin poked his head out of the greenhouse today and walked around in the sunshine for a little while. It was so good to see him happy–of course, you now see how I am–I am presuming my tortoise is happy! LOL! I see a few friends here 🙂 We had a turtle in Southern California . He was named Gus. He lived in our pond and hibernated during the winter. One day I said where’s Gus? He usually climbed up on a rock to sun himself and get out of the water. My husband said oh he decided to take off and walk – last saw him walking down the street. Yikes! Oh my goodness, Carla! Poor Gus! Ha! But we guard our gates closely because Darwin would definitely wander off. We found that out the hard way, and fortunately a neighbor intervened in time to prevent disaster. He was in the middle of the street! Now we go through ridiculous measures just in case. Fortunately he doesn’t dig, and he is now so large there aren’t any other obvious ways we could lose him. Aren’t these creatures funny! We often remark at his rather prehistoric features. Thank you so much for stopping by!